Muck Petzet: Your reconstruction of the east wing of Berlin’s Museum für Naturkunde [Museum of Natural History] is already well-known—I would almost like to say, famous. In the German Architecture Annual 2011–12, the jury selected your project as the best, and elsewhere you have also been inundated with praise by friends and foes of reconstruction. Especially in Berlin, it’s something quite rare to see new architecture that does not divide but unites. The photos of your fascinating, oldnew façade of the east wing are well-known, but as I was there for the first time, I couldn’t initially find the façade at all. You need to go past the door staff and a barrier and then you find it, far from the main entrance, in a kind of maintenance court, in a very quiet place—not at all visible from the street. How were you able to justify applying so much devotion to detail in such an ordinary place? Roger Diener: That didn’t influence us. It’s also not true that the place is shielded completely from the public—the students of nearby institutes, for example, regularly come by here. The task was not to design a striking public façade but to complete the wing, which had been destroyed in World War II, as part of the overall ensemble—without covering up or negating the traces of history or the sophisticated form. We were interested in a convergence of old and new parts, an overall version that challenges and breaks with traditional viewing habits: here, the parts you would expect to see in wood or glass are cast in concrete, producing an almost surrealistic effect. Our work is designed so that it only reveals itself at second glance. I’m certain there are people who walk past without noticing it. Nothing seems out of the ordinary until you cast your gaze precisely at it. MP: Why this distancing effect? RD: It developed directly from the project requirements. The collection of animal specimens preserved in alcohol that is stored and displayed here precludes any daylight and any influx of outside air. On that account, and because of the explosive properties of the alcohol, these collections are accommodated underground with good reason in most museums. In other words, being able to reconstruct the original façade was out of the question; hanging curtains in front of windows wasn’t even an option. MP: Nevertheless it’s a contribution to reconstruction. RD: We don’t balk at the term “reconstruction” as long as it’s used in a differentiated way. We’ve made a number of small interventions in the old halls of the museum. When dealing with the preservation authorities, we identified these as repairs, but actually they’re many small reconstructions—completely invisible. Despite the new requirements, we didn’t want to create something entirely new for the façade of the east wing. So yes, the project is a contribution to the reconstruction debate. The proponents now say, look here, it works—and the critics say that’s the way it has to be. Because we simply don’t try to desperately apply the original condition to today’s circumstances. 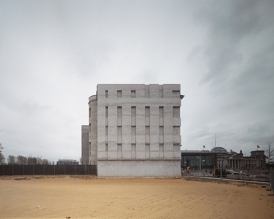 With David Chipperfield’s Neues Museum there was a similar response. I think that shows above all that the acrimonious debate in Berlin has long since arrived at a deadlock. The question of whether one should reconstruct cannot be answered in general terms with yes or no. With such a polarized attitude we won’t make any progress. In dealing with what already exists, so many diverse and beguiling opportunities arise. Why should we limit ourselves to a yes orano? Florian Heilmeyer: Part of this distancing effect is that you have bricked up the open windows that had remained in the extant parts of the façade. The windows in the reconstructed bays of the façade, by contrast, have window frames and glass panes. RD: In the replicated part—in other words, the fictional façade— we’re dealing with a replica. With the well-preserved façade, on the other hand, it was a matter of rehabilitation, of making modifications to meet the new requirements. So there we had the windows bricked up. MP: At the same time, it’s no longer possible to be sure whether the bricked-up windows were already closed off before your alterations. RD: Exactly. There’s no right or wrong; no yes or no. In the end, you stand in front of it—and then the only question is whether it pans out atmospherically. The new parts already formulate a distance from the existing, but it’s a very “faint” distance, I think—almost subtle. There’s no emphasis on the joint. The dividing line is as inconspicuous as possible. 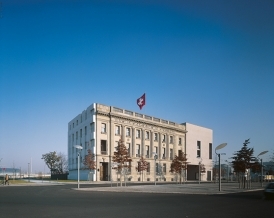 MP: With the construction of the Swiss Embassy in Berlin, you had already accomplished a similar distancing. As with the east wing, the relief in the pale concrete also engenders the allure of a black and white photo. Like preserving a memory of something that used to be there, even if you no longer know exactly what it was. An artistic strategy? RD: Yes, I think that’s the case. But you can’t always be absolutely sure what makes you do things. MP: At the embassy, however, there’s a much stronger separation from the existing building. RD: There’s something else at play there, because the relief makes reference to the missing neighboring building. That’s how Helmut Federle and I designed it back then; there are no references to the inside of the embassy. It isn’t even a constructive part of the building, it’s completely separate. As if it were leaning on the embassy building. MP: We’ve discussed that both projects are actually a kind of recycling. Not in a technical sense, because indeed no materials are recycled. But certain images and certain motifs are reused—a kind of form recycling, if you will. RD: It’s not about the form in the narrow sense; it’s more about the idea of deposits, of layers. You would have to speak more of gestalt than form: we wanted the history of the ensemble as a whole to be expressed in the new parts. In a very precise reconstruction, there’s always the frustrating experience that the age value is lost. At the natural history museum, I have the feeling that we succeeded in expressing the time in another, compressed form. Old and new can surprisingly and naturally stand side by side, and suddenly it’s no longer certain if the colorful part is what’s old, because the achromatic part looks almost like an even older layer. In the reconstruction of the Alte Pinakothek in Munich right after World War II, Hans Döllgast had already achieved a similar abstract effect with his newly added parts. In their simplification, something emerges that seems like a raw version of the building’s historical elements. There’s no competition between old and new, even though there are two clearly distinguishable layers of time. But they can’t be arranged in a clear order. The convincing and suggestive power of the building comes about because Döllgast places the new parts like archetypes next to the old parts. MP: Where do you see the difference to the Venice Charter? RD: I believe the Venice Charter has been greatly misunderstood, especially by architects. It’s nearly just half a sentence in the Charter saying that what’s newly added should be configured in such a way that it’s recognizable as new vis-à-vis the existing condition. But if you read the original text in the Charter, then the rest of the paragraph before that half sentence actually says that, as a basic principle, the new may not diminish the effect of the existing. The sentence about distinction doesn’t come until after that. Unfortunately, most people know only this last part but not what is written before that. This has triggered devastating developments, because architects have interpreted it as a license granting them unbridled permission to establish contrasts with respect to what exists. MP: Just like Karl Josef Schattner and Carlo Scarpa later demanded. RD: Schattner and Scarpa have decisively influenced this development. My problem with this attitude is that it’s simply not a continued development of the existing condition, but more of a final accounting. It’s a quasi-ahistorical attitude, because they’re looking for a final state. Here the old, there the new. How can you build on that? How can you perpetuate that? I think the main difference to our approach is that we proceed with the awareness that, as architects, we work on a project at a certain point in time which won’t be the last. There have been others there before us, and there will be others who will follow us. We’re responsible for ensuring that others can build upon our work, if necessary. FH: But as an architect, you still leave behind visible traces. RD: Of course our work doesn’t come without its traces. These traces may even be very personal aspects pertaining to one’s own interests as the architect responsible. But they must be integrated into the basic conditions. By this, we mean first and foremost the social mandate of architecture: making space available in a decisively qualified form. Secondly, the local context, in other words the existing condition. My notion of the city is an experience of the concurrence of older and newer parts. It presents itself with a limitless collection of means to fashion the distance or proximity between old and new. As architects we’ve never had any trepidation. We’ve never worried about whether our contribution can assert itself when viewed in isolation. Even with freestanding buildings, we expect them to develop a relationship with their surroundings, integrate themselves, and enhance the effect of what already exists rather than reduce it. 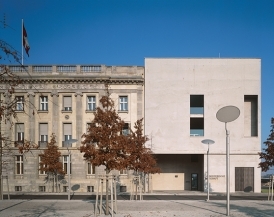 Conversion and extension of the Swiss Embassy, Berlin, 1995–2000.